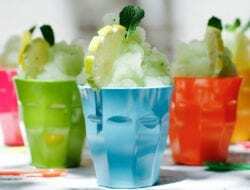 Best boozy foods – don’t just drink it, eat it! We all like to indulge in a tipple or two of our favourite drinks, but why should the fun stop at supping and leave out munching? Well, we don’t think it should, and luckily there's a plethora of fantastic boozy recipes to accompany many a libatious session. Below are our four top picks. Even thinking about this seasonal dessert sets our salivary glands to flood – any recipe that needs to be made six months ahead of time and fed with a daily quarter shot of brandy, is okay by us! However, the inebrious Christmas pud also requires a swimming pool of brandy sauce, which means that together, they total an ABV so high, it’s ACTUALLY FLAMMABLE. You had us at tequila. This Mexican marinade is tangy, fruity, herby and – most importantly – boozy. Creating a good marinade is absolutely key to successful grilling. The reason for including an acidic agent (like the lime and tequila) is so that it helps to break down the collagen interspersed between the meat’s fibres, ensuring that your tenderloin is very tender indeed. Olé! This decadent sweet was re-popularised in the ’70s, but has roots that date back to the 17th century. What started out as an non-alcoholic Polish pastry, called a babka, made its way over to Western Europe via France, where they decided to soak the brioche-like bun in a sugared rum syrup. Naples soon caught on, and this divinely drunken dessert has been a speciality there ever since. Some variations including a stuffing of Amalfi lemon cream. Semplicemente magnifico! While these are our faves, this list is far from complete, so be sure to have a dig around the wilderness of the recipe-web to unearth more spirited dishes – cheers!